You might have to be an old-school computer programmer (or a math geek; sad to say I'm both) to get this, but Halloween is precisely equal to Christmas! Don't worry, I'll explain it at the bottom of the page. In the meantime, here's the deal, just until Halloween: Buy my Complete Start Farming Pack with Audio, and I will also send a free download link to a friend or family member of your choice, at no extra charge. 1. Buy the Complete Start Farming Pack anytime before midnight on Halloween. 3. I will send your friend a free download link to get their own copy of the Complete Start Farming Pack. 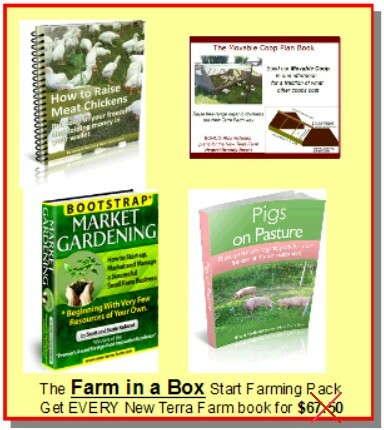 The Start Farming Pack is comprised of ALL my e-books and software, including the special 60-Minute Small Farm Marketing and Management Audio Teleseminar. That's 10 items in all, and you and your intended recipient can access them all right away, no waiting for a physical book to be shipped. Note the Two For One Special expires at midnight EST October 31. If you have a friend thinking about starting a small farm, click on 'add to cart' to buy the Start Farming Pack, then complete the form below and give both you and your friend a 'head start' in the small farming game. Oh yeah, why do I make the claim that Halloween is precisely equal to Christmas? It all adds up if you understand the octal (base 8) numbering system, something us old programmers were familiar with. If I write '31' in base 8, that equals 3x8 + 1 = 25 in base 10 (or the decimal numbering system). So 31 Oct is precisely equal to 25 Dec! Math geeks didn't get the babes, so this is how we amused ourselves (sigh).